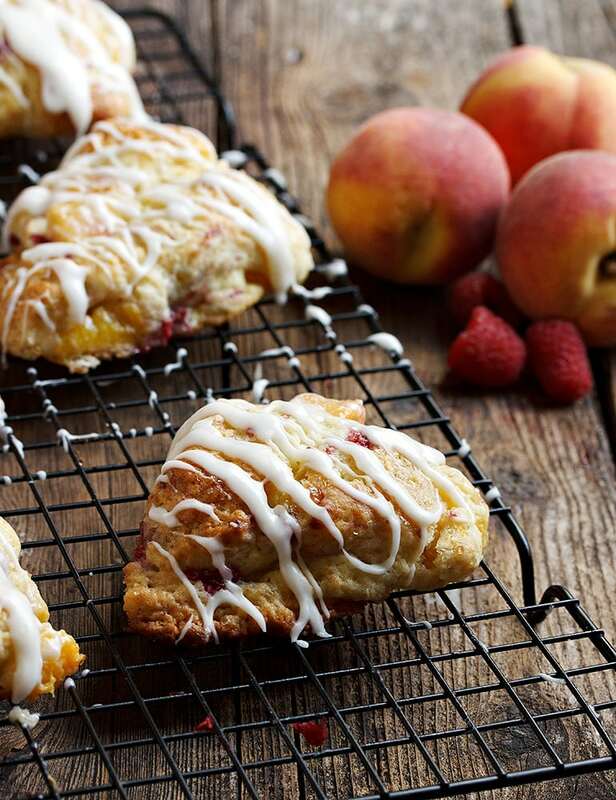 Lightly sweet, these Peach Melba Scones are chock full of fresh peaches and raspberries! Served with a sweet glaze. I couldn’t let this week of celebrating peaches end without baking up something a little sweet. These peach melba scones are absolutely filled with fresh peach chunks and fresh raspberries.These scones are perfect for enjoying any time of day! These scones are a breeze to make in the food processor, so it’s worth busting it out, if you have one. If not, simply mix by hand in a bowl. I try to sneak as much fruit as I can in to the dough, but not so much that there isn’t enough dough to hold them all together. Good sized peach chunks are nice, for great bites of fruit. These scones freeze beautifully. If glazed, simply freeze on a baking sheet, then transfer to a freezer container once the glaze is frozen. Thaw at room temperature. You can easily use a lighter cream or milk in place of the heavy cream in these scones. Of course, they won’t be as rich, but they will still be lovely. The process of incorporating the fruit is a bit of a messy affair, as the moisture from the peaches will make things a bit slimy. You’ll also want to be as gentle as you can to avoid crushing all the raspberries. Just do your best and try to sneak as much fruit as you can in here and there and press together gently and firmly. It doesn’t have to be pretty, just together enough to cut in to wedges. Delicious and filled with fruit, these scones are most easily made in a food processor, but if you don't have or want to use one, simply mix in a bowl. Preheat oven to 425 F. Line a baking sheet with parchment paper and set aside. Prepare the fruit and set aside. Measure out the cream and add the lemon juice to it. Stir to combine then set aside. (If you don't have or want to use a food processor, simply recreate the steps in a large bowl by stirring in). In a food processor, combine the flour, sugar, salt, baking powder and baking soda. Pulse a few times to combine. Add the butter chunks and process until butter pieces are the size of small peas. Add 1/2 egg and vanilla to reserved cream and stir to combine. With processor running on low, slowly begin adding cream mixture, just until dough comes together in to a ball. (I usually use pretty much all of it). Turn dough out on to a well-floured work surface. Scatter fruit over top of dough and with floured hands (or sprinkling additional flour as necessary to control the stickiness), incorporate fruit (try to tuck as much of it in as you can) and shape in to a 1-inch thick round disc. Using a sharp knife, cut disc in to 8 equal wedges. Transfer pieces to prepared baking sheet, leaving room between each piece. 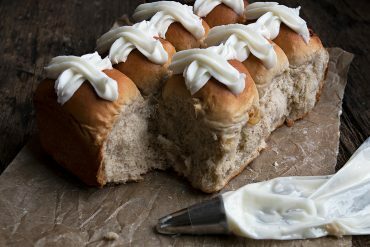 Brush scones with whipping cream (or milk) and sprinkle with turbinado or white sugar. Bake in preheated oven for about 13-15 minutes or until golden. Remove to a cooling rack to cool completely. The combination of peaches and raspberries sound refreshing and tangy, delicious. I have yet to make scones, there is something about them that intimidates me and I shy away from the challenge. Raspberries and peaches, such a great combination, I will give this a try! What a great way to showcase fresh summer peaches. Your photos are beautiful! Thanks so much, Shareba :) I think you would enjoy them! Peaches are definitely in season, and I’m loving the combination with raspberry here! Thanks for sharing!! OMG ! You did it again ! I just made 1 hour ago, and my mom and I are just ate. It is so delicious and not sweet , outside crispness and inside is soft but not gooey at all . I don’t have raspberry ,so only I was adding Peach, but no problem. Still very very good !! The first thing on my mind, when I was doing dough from blender, that was so soft and wet. 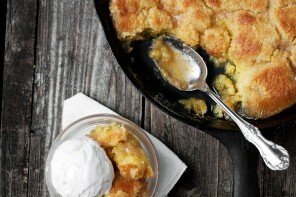 And plus Peaches are adding , OMG ! I was afraid of failed . But it came out wonderful smell and top of scorns are perfect brown color ! Thank you , thank you , thank you ! 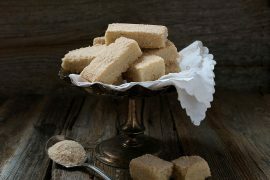 I never failed or dislike at all on your receipe that I made them so far ! What a wonderful combination! The color alone is gorgeous and you know how much I love baked goods. I bet these are memorable with a nice crunchy top and soft warm middle – what a treat! Thanks Tricia :) These were perfect with all the fresh fruit! Oh my god Jennifer you have my stomach rumbling like crazy. These scones are just gorgeous! I made these and they are as good as they look! This is a keeper! Seriously, these are the prettiest scones EVER, Jennifer!! And I am going CRAZY over the flavor!! Peach melba?! Holy cow – I NEED about a dozen of these pronto! Thinking I sure triple the recipe since these freeze well so I can have them on hand ALWAYS. Perfect, girlfriend! Cheers! Oh, I’m just dying over these, Jennifer! I’m heading out to get some peaches tomorrow and pick some raspberries, too. My goodness, sometimes the beauty of your food leaves me speechless – seriously! A funny little story: I was cleaning out my ridiculously long list of ‘favourites’ and came across a file marked ‘stunning food photos’. It was at least 3 years old since it was updated but the thing that made me smile so much was that at least half of the photos in that file were yours! :) You’ve always been an inspiration! Thanks so much, Robyn and that is a funny story :) I appreciate it! OMG Jennifer, these scones look fabulous. So seasonally perfect. Can’t wait to add them to my favorite scones list. 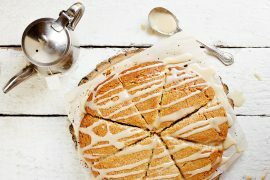 A very nice combination for a scone, I would like to try this recipe as soon as I can. I can eat a scone anytime of the day. I especially like them as a snack before bedtime with a cup of tea. Honestly what really had me were your pictures of the scones, great shots Jennifer! What a great idea!! Raspberries and peaches normally make up my breakfast smoothie, but I really like the idea of having them in scone-form, instead ;) Gorgeous pictures! Just gorgeous scones! I adore the raspberry-peach pairing! I’m imagining a bite of these and crying to myself that it’s only in my imagination. This is one of my all time favorite combinations, raspberries and peaches and I think the name peach melba is so fun too!